An M5Board forum member took his 2007 BMW M5 to the dealer for brakes and fresh oil. Their 20-year-old tech crashed it during a test drive. The dealership's offering him $2500 in parts. The problem? There's $30,000 in damage. It's a topic of heated discussion over at M5Board, racking up over 108,000 page views so far and causing a bluster within the M5 community about the whole issue of service and owners rights. There are over 38 pages of commentary but we'll do you the favor of breaking it down to the key details. Dealership rags my car and wrecks it on a test drive! Of course this incites the fires of hell in the commentary, and many suggestions to carefully document the incident, tell the dealer to do nothing until he gets some legal advice and then go from there. This all took place this weekend. No doubt about it, the mechanic was driving reckless. I measured 110 feet from the point of intial impact to where the car finally stopped. This does not include the brake marks before impact. I forgot to mention this all happened on a 30 mph street. Well...this is how the day went. They are not going to do anything other than have the car fixed. Of course they offered to fix it themselves and give me a loaner. They estimated a parts only cost without painting to be $2500. I talked to the GM (General Manager -Ed.) about depreciation, extended warranty, buying my car, selling me another car, you name it. He said if anything was damaged in the engine/drivetrain they would know it and they didn't find anything. They are not going to budge off of anything they feel like they are not required to. This is all after finally admitting they were grossly negligent and the 20 year old kid trashed my car like a rental! As soon as the owner said absolutlely no to any other option I told them not to do anything to my car, box it up and send to another dealership that another board member helped me out with (thanks again buddy). The GM then said they were going to immediately turn this over to their insurance. Get this, their deductible just happens to be $2500. They acted like this happens all the time and they already have a lot of lawsuits on them. Contacting my lawyer in the morning for next course of action. I am willing to bet the next dealership is going to find a lot more wrong with this car. And the next dealership did just that. After removing some body panels for inspection, they found a broken strut, borked inner brace, bent steering gear assembly, damaged rear suspension many instances of body damage, in total about $14,000 in parts and another $16,000 in labor. 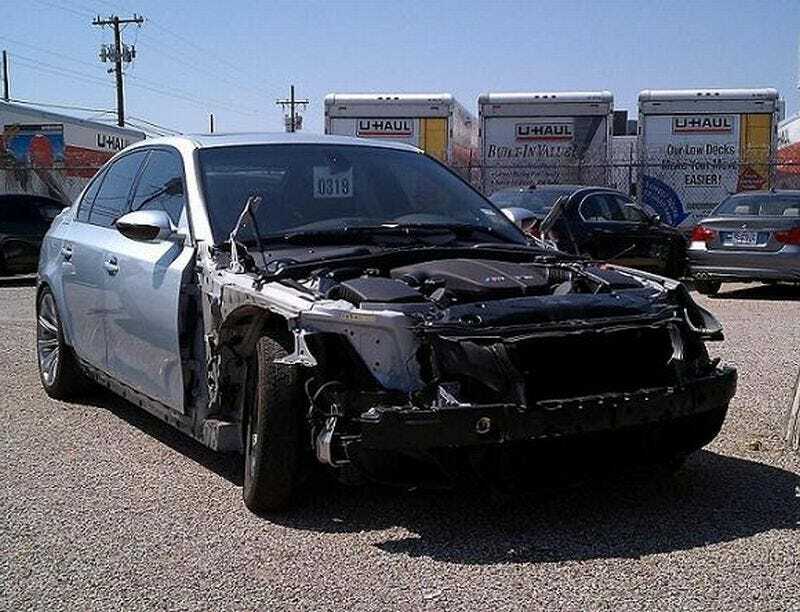 Currently the boned M5's owner is seeking further legal advice and negotiating with the dealer. One of the most clever parts of this story is how the actual dealer's name has never been mentioned, and that's by design. We're sure a dealership would be willing to work towards an amicable solution rather than have their name anywhere near this debacle. Our guess? It's either Autobahn Motorcars, Moritz BMW or BMW of Dallas given the M5Board member's from Fort Worth, Texas and those are the only three BMW dealers in less than 30 miles. We'll stay tuned to find out how this all ends.